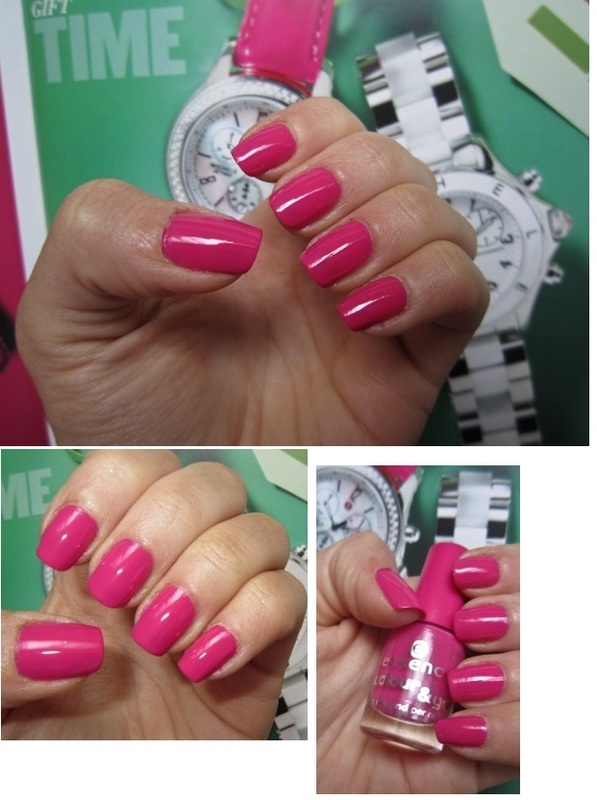 NOTD: Essence Colour & Go in 08 Ultimate Pink! I got this nail polish yesterday at ULTA.. Essence has some really cute colors and they’re only 99 cents each! I was temped to buy a taupe and a grey.. but I figured I own enough of those. I’m not sure how well these polishes wear.. I only have one other Essence polish that I puchased last summer. I think they’re pretty average.. but I’ll update this post and let you know when my nails start chipping. The formula is very nice.. it’s not too thick or thin. The color is opaque and the color dries pretty quickly. It says “1 second per nail”.. which it’s not exactly 1 second.. but it’s around the same as an OPI polish. I applied a second coat within a minute and my nails didn’t cake up or get nicked. I also really like the brush. It’s not too long and it’s pretty thick (not as thick as Rimmel Lasting Finish though) so it makes applying the nail polish very quick. This is two coats, no top coat. Maybelline Born with It and Pink Please Color Sensational Lipsticks Review, Photos & Swatches! What a steal! looks great on the nails and I'm so happy to hear that it doesn't nick or scrunch up – I hate when that happens! Such an unnecessary mess. LOL Now if only they would appear in Canada.. I love pink! I have a similar color but it's by Revlon. Love the colour, so vibrant! And what a steal! Now if only I could find a lippy in that colour…. Ooh… I love this color! I love my dark polishes, but lately have been wanting to bust out my Van D'Go and Beautiful Girl! I've never tried Essence polish, but it sounds and looks good. It looks really shiny. I was surprised to read that you didn't add a top coat! BTW, thanks for your response on my post. I can't wait to see what home made stuff you come up with! P. S. You and George look so cute in the picture in your side bar! elleovely – LOL.. Yeah it totally is!! Thats why I don't like buying polishes that don't dry quickly.. It's such a waste of time to do your nails and get them all messed up! Makeup and Macaroons- Lol.. yes!! Kate – Me too.. I only use to wear pinks… neon pinks and pastel pinks until IO started my blog. I barely ever wear pink anymore.. mainly deep colors. It is pretty shiny.. I actually forgot to put a top coat till now and they're still fairly shiny. And Ty!! George hates that picture.. He thinks it makes him look fat LOL. But I think it's cute too.. we rarely get pictures where someone ELSE is actually taking it. It was on Christmas Day. Gail – Oooh.. I'll check it out! EllysMakeupbag – YES! It totally does! I wish I owned Girl About Town.. 😦 It's so gorg. I think I'll try hunting down a dupe. Thanks everyone else for commenting! No chips yet… yay!